Flowers bloom in watercolor for spring. Is there anything better than the coming of spring? What a great time. The season hopeful of things to blossom. New ideas, new thoughts, flowers pushing up through the soil bringing beauty. Nature comes alive. The studio is working with flower boxes. 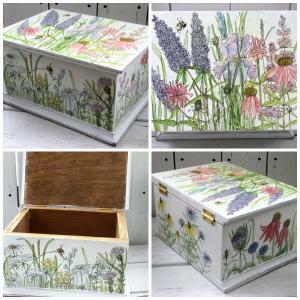 Wood custom made boxes hand painted with watercolors are witty and fun. One of a kind functional art created to add to my flower art prints. Custom painted furniture and Painted Flower Boxes are investment pieces that will bring nature home for decades to come.